The Razer phone is a brand new device includes a 120Hz display and near stock Android with (admittedly closed off) OMS support. If you’re interested in purchasing one of these devices in the US, you can now purchase it from Razer’s own website. The phone will set you back $700, though that’s still a lower price to pay than some of the major flagship devices, especially for the specs that you get. The official launch date is November 17th, however, so it likely won’t ship until or around that date. For $700, you’ll be getting a Qualcomm Snapdragon 835, 8GB RAM, a 120Hz, 1440p, IPS display, dual front speakers and a large 4,000mAh battery. The Razer phone should more than meet the battery needs of any normal user. Of course, it’s a gaming phone at heart, but the Razer Phone will pique the interest of just about any power user as the phone comes with flagship level specifications. The device is not only launching in the US on November 17th but worldwide, and Razer has also coordinated its launch with some carriers in Europe. For example, in Ireland, Denmark and Sweden, Razer has made a partnership with Three and will be selling the Razer Phone exclusively through the carrier for now. In the countries listed above, you do not need to buy the device on contract as you can buy it unlocked if you prefer. If you are seeking the special edition of the device with the illuminated green logo on the back, you will be forced to import it from the US store if it is restocked in the future. Nextbit, the company who successfully crowdfunded the Robin back in 2015 was acquired by Razer at the start of this year. This upset a lot of those who had helped Kickstart a project that they were hoping would have gone on for years to come. Sadly, the company had to end support for the Robin after the acquisition but they didn’t stop working on a smartphone. At the new company, the team began working on what has now been officially announced as the Razer Phone. As you can tell from the previously reported hands-on video, the Razer Phone takes some of the design cues from the Robin. Sure, it doesn’t match the color options the Robin had but it does have a similar shape as both went a squared up design. The company also moved away from the plastic build materials and opted for anodized aluminum this time around. When we look at the actual hardware components though, this is where things really start to drift away from the Robin. 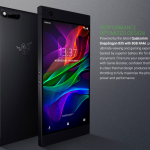 The Razer Phone comes equipped with the best system-on-a-chip that Qualcomm has to offer right now, the Snapdragon 835, so it can compete with the rest of the flagship smartphones on the market right now. The company is advertising it as a smartphone for gamers so it makes sense that the company opted for 8GB of RAM instead of the 4GB or 6GB modules that the competition offers. To go along with the gamer theme, we also learned that the Razer Phone is the first smartphone in the U.S. to come equipped with a 120Hz display. High refresh monitors are popular within the gaming community with 144Hz generally being the most common. So Razer opted for a 5.7″ 1440p IGZO LCD 120Hz panel to make the gaming and even regular UI interactions as smooth as possible. Apple was commended for using a 120Hz display on the new iPads and it fits in perfectly with the new Razer Phone. Along with the 8GB of RAM the device also has 64GB of storage (with microSD support) for loading many popular mobile games onto it without worrying about running out of space. Inside we’re also seeing a massive 4,000mAh capacity battery that again, helps with the gaming theme that the company is going with, because this will help power that Snapdragon 835 SoC for extended gaming sessions. The back of the device holds the typical Razer logo that we’re so familiar with, and a dual camera setup. Both of these cameras are 12MP sensors; one has a wide angle lens to help you capture more scenery in your photos while the other is a 2x telephoto lens for zooming in close. On the front of the device we do see larger bezels than we’re used to seeing from flagship smartphones this year, but they do serve a purpose. The top and bottom bezels house two stereo speakers with each of them having their own amplifier for enhanced Dolby ATMOS audio, and its THX-certified as well. The device has two volume buttons on one side with the power button on the other side. These are placed in spots that are away from your fingers when you’re in a typical gaming session in landscape mode. The power button has a fingerprint sensor embedded into it, like we’ve seen on Sony devices, and it is the first smartphone to come with Qualcomm’s Quick Charge 4+ fast charging technology. They’re telling us it will charge from 0% to 85% within an hour. The last bit of today’s announcement is about the software features that Razer has added to their first smartphone. The company has announced that the Razer Phone will be using a near-stock version of Android (7.1.1 Nougat at launch, Oreo in Q1 2018) which many believe will be needed in order to prevent performance degradation that we’ve seen from other heavy OEM ROMs. Another interesting tidbit is that the device will have Nova Launcher Prime Razer Edition pre-installed right out of the box. They’ve also brought some of their Razer Cortex technology from the PC to the smartphone in the form of the Razer Game Booster. Similar to how Samsung has their own Game Launcher, Razer’s software lets you configure how you want to play the game by optimizing for battery life or performance. You can choose between different frame rate options, a specific resolution, CPU clock frequencies, anti-aliasing, and a do-not disturb mode when in a game. Sadly, it will not have a 3.5mm headphone jack and it doesn’t come with any water resistance either. These two features have been hotly debated topics within the Android community as of late, but the company is betting that the missing functionality will not be deal breakers for the majority of their target audience. The Razer Phone is priced at $699 with a November 17th launch date. You can go to the Razer website to reserve your device right now. If you’re interested in purchasing the device, check out the link below!